Tandem biking is one of the camp’s morning activities. 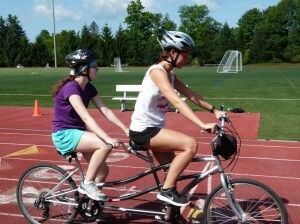 Campers are able to choose to ride an individual bike or tandem bike. Campers learn bike safety and awareness before riding bikes around the track on the Skidmore College campus.